lapPAC facilitates independence and privacy for students using motorized wheelchairs. Typically students who use motorized wheelchairs carry all their possessions in backpacks that hang on the back of their chairs. The students do not have the ability to reach around behind their chairs to access the backpacks. 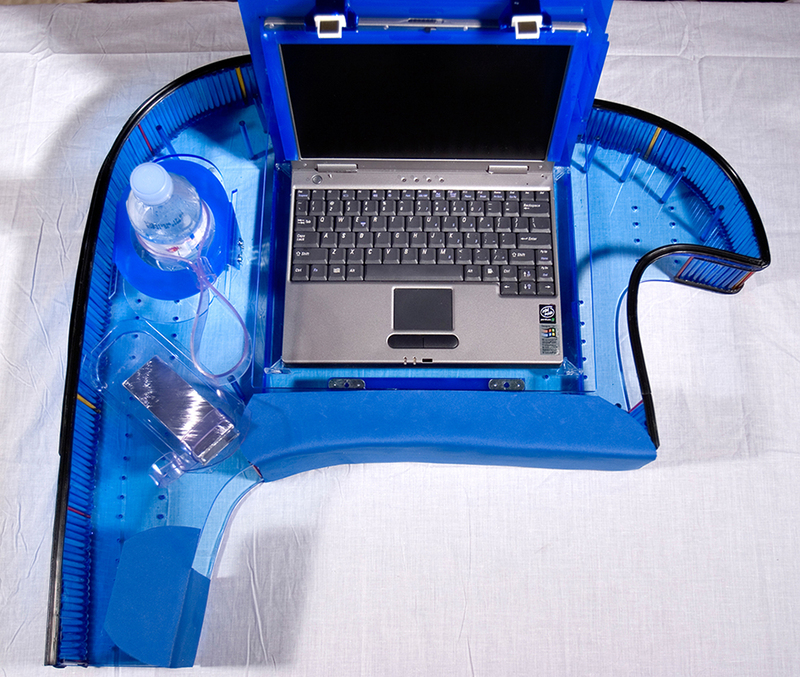 This lapPAC is designed for students with Duchennes Muscular Dystrophy(DMD). Students with DMD have limited reach and macro-movements while they retain dexterity and micro-movements. The lapPAC provides DMD students with the ability to access a laptop, a voice recorder and a water bottle. The form and aesthetics of the lapPAC is proof of concept that assistive technology devices don't have to be clinical to be functional. This tray is currently being used by a student at a public school in New York City. The student calls it his "docking station". Consultants: The students who use motorized wheelchairs and the occupational therapists at P.S. 199 in New York City. Developed in Introduction to Assistive Technology at Interactive Telecommunications Program at New York University.